2010 is a 3 global year, and 3 is the number of OPTIMISM, which is NOT blind hope or wishful thinking. Optimism is the feeling that the change we desire really does have a good chance of succeeding. Optimism can color our outlook and shape our thoughts and actions and, after 11’s relentless spotlight on reality last year, we really do need a large dose of optimism if we are to start making the changes we know we need to make. WE, the people, are the ones who must change things on Earth. Industries, governments and armies cannot do this. This system is incapable of changing itself because it is designed to resist change at all costs – and the cost of that rigidity has been enormously high. 3 is the number of popularity, population, and PEOPLE. So, the power of 3 is very much about the ‘power of the people’. 3 is also the number related to personal happiness. People are sick of being unhappy, and yet we instinctively know that we cannot be truly happy until we face and resolve the underlying causes of our unhappiness. This year, we are likely to find innovative ways to make changes that we were always led to believe were not ours to make. 1. The Triangle of INNER VISION. 2. The Triangle of FORTITUDE. 3. The Triangle of INSPIRATION. (We have not experienced this energy in over 100 years). 4. The Triangle of COMMITMENT (We have not experienced this energy in over 300 years). Remember that these powerful energies provide an elaborate introduction to 2010, and are NOT a description of 2010 itself. They do, however, provide a foundation – a potential – for the rest of the year. 3 is the number of art and entertainment and, already, on day one, 3 is treating us to a big production – not from the numbers in today’s date, but from the numbers that are missing from today’s date…..
3 is the number of CREATIVITY, COMMUNICATION, OPTIMISM, POPULARITY, PEER PRESSURE, GOSSIP, HEARSAY and SURFACE APPEARANCES. 7 is the number of KNOWLEDGE, INTROSPECTION, ANALYSIS, PLANNING, WISDOM and SECRETS. This is the energy of truth-seekers and truth-tellers who came into this lifetime to fulfill an important service to humanity through unconventional and memorable means. These people are rising now, and you may even be one of them. This is likely to involve the future of Planet Earth in some way, through teaching, leadership, reporting, environmental and political awareness and/or the expressive arts. This energy enables us to instinctively ‘know’ answers to questions that we have been unable to solve in generations. This energy helps us to live in a state of FREE WILL and LOVING INTENT so that we can be honest and open in our dealings with each other. The closest we have come to this understanding is ‘free market’ capitalism, which is a contradiction in terms because nothing and no one within that system is actually free. THE TRIANGLE Of INNER VISION helps us to imagine “IMAGE-IN” – new and evolutionary ideas for better ways to live. THE TRIANGLE OF INNER VISION raises our psychic and intuitive abilities, and we do have to learn to TRUST the visions that our minds and feelings formulate! This combination of thought and emotional sensation, within the body, is essential to our evolution. 4 is the number of CONSTRUCTION, HARD WORK, RESTRICTION, DETAILS, TENACITY and BREAKTHROUGH. 5 is the number of CHANGE, FREEDOM, RESOURCEFULNESS and SUDDEN DEVELOPMENT. THE TRIANGLE OF FORTITUDE is the great ‘taskmaster’ of the numerical planes because it teaches us the power of patience and endurance, and how to find ways to deal successfully with unfavorable circumstances. THE TRIANGLE OF FORTITUDE exposes areas in which we seem helplessly drawn to matters which trigger our fears, and test our patience and our Will to carry on. These are difficult times, made a lot worse by those who have no interest in changing the world for the better. But what we are gaining from this rollercoaster is an unusual level of resilience, resourcefulness and intelligence. This energy helps us to develop the strength and knowledge to be able to deal with anything that life throws our way and, just as importantly, to quickly solve or avoid difficult situations in the first place. What we learn from THE TRIANGLE OF FORTITUDE can lead to major accomplishments which really can change the world for the better. 9 is the number of CREATIVITY, GIVING, ENDINGS, DRAMATIC EVENTS, DRAMA ITSELF, GLOBAL AWARENESS, DEEP EMOTION, and COMPASSION. We have not experienced THE TRIANGLE OF INSPIRATION in over 100 years because every day of the 1900s contained the number 9). Its return is likely to produce an upsurge of charismatic people who inspire others simply by being able to relate to them. Inspiration creates enthusiasm and moves people to action of some kind. 3-6-9 shows us that emotion adds depth to thought. Without feeling, people cannot think for themselves and must be told by others what to believe. Everything must be simplified, and communication is then reduced to mere sound-bites which are repeated until it’s message is perceived as fact. Our experience with THE TRIANGLE OF INSPIRATION will help the ‘information age’ evolve into an authentic AGE OF TRUTH. After 100 years of drifting towards “sameness”, (the result of fear of anything that is different), individual uniqueness is again being sought and encouraged, along with the gifts and talents that were buried along with it. We must be careful how we judge our selves and others as we begin freeing ourselves from the confines of mediocrity. We must also know when it is in our best interests to keep a low profile as there are still many others out there who do not want you, or anyone else, to evolve. In the past, individuals on this plane preferred to work alone and often appeared odd or eccentric. In the 2000s, it is essential to work in partnership with others so that previously overlooked connections can be made. Knowledge must be shared for the common good. We have not experienced THE TRIANGLE OF COMMITMENT on Earth for over 300 years, (all dates in the 1900s, 1800s and 1700s contained one of these numbers). This is the energy of dedication and devotion to a particular purpose. It is the energy of determination and perseverance. In the past, many of the people effected by this energy were greatly misunderstood until they were able to get their ideas, mostly scientific, healing and metaphysical in nature, into mainstream consciousness. Their ideas were very much ahead of their time and yet they persisted, and dedicated their whole lives to developing their knowledge. This spectacular entrance into 2010 reminds us that important things are going on in our lives of which we are only half conscious. We could solve so many problems, individually and collectively, if we would only look at the full extent of the details – the big picture! We all want to know more about the true nature of life and where we are headed, but we stop ourselves from learning because we are afraid of how reality may make us feel. That is why our feelings and emotions (our feminine energy) require so much extra attention these days – so that they can heal from perpetual suppression and become the powerfully loving part of us they are meant to be. Very simply, if we cannot feel, we cannot experience love because love expresses itself as a feeling. The fact that 2010 starts on such a high vibrational frequency, and with such specific numerical energy, suggests that the optimism of 3 can be a major source of constructive change this year. We simply have to believe that change IS possible – AND – that everything, including change, starts within. This two day stretch of time forms what could be a lasting foundation for the months, weeks and days to come. It describes our potential for drastic and positive change. Whether we use this opportunity to our benefit is up to us. PART TWO – 2010 – BECOME YOURSELF! This entry was posted in new year, numerology, year ahead and tagged 2010, 2010 numerology, 2010 year ahead, 3 Global Year, commitment, dedication, mumbers, new year, New Year Forecasts, optimism, resolutions, triangle, truth. Bookmark the permalink. I was blessed to find you and your amazing work on the first day of this year and I feel you’ll be an important part of my journey through 2010! You provide the exact type of numerology information coupled with spirituality that I was seeking to find! You’re a true blessing and an inspiration to us all! I love the spirit of your writing. I feel so encouraged for the year ahead. YES- The Big Picture ! I am in! – Keep us goin optimistic ! Your talent is remarkable….I am such a huge fan….Thank You. Thank you for sharing your knowledge and inspiration with us. Happy New Year! Fantastic article and FANSTASTIC NEWS! I am VERY excited about the doorway energies you write about that have come into play this January. How fortunate for all of us that they are assisting us. I couldn’t think of any better energies that I would want to help me at this time. Happy New Year to you! Thank you so much for sharing your wonderful insights,wisdom and articles. I enjoy your fresh perspective. Happy New Year, Christine. Thanks for your wonderful work and guidance through your readings, which have been so accurate and insightful for me. I devotedly check for my weekly reading every Thurs. Please keep going! Happy New Year, Christine! Looking at the full moon on the 1st January, making all my wishes for a peaceful year where we actively can contribute, I could feel something magic and strong in the air. I feel that 2010 is going to be a very crucial year for all of us. Thanks for your wonderful work, which is intelligent and sensitive, and a true gudance for us. Happy New 2010 Year. Thank you for sharing your gifts and information. I feel the truth and fullness of all that you write about, and would love to connect with you. I do Awakening Andromeda Transmissions where fear frequencies are neutralized and lighter frequencies come in, and work with people all over the world. it is a grace filled way to navigate through this ever changing time of miracles and self awareness, and connection to self, source, and others. You are so right. It is a time of working together. I would love to connect with you and learn more about what you do. Thank you so much for putting your words on line, it is wonderful to be so inspired by you. It’s perfect synchronicity of all that I need! I wanted to say, I have been reading your inspiring words every month and have bought your book. Your uncanny ability to provide guidance and to say exactly what is needed is a divine gift. I always wondered about the triangle. I have one plotted on my face with 3 moles. It is like an equilateral one and very conspicuous.I think there is some kind of significance to it.You information was pretty interesting. I had no idea there was so much meaning to a triangle. Hi there, my name is Kathleen Lamoureux. I am the co-editor on the numerology page for http://www.allthingshealing.com. 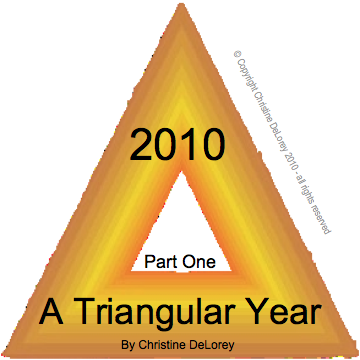 I am seeking permission to post your numerology article “2010 – A Triangular Year (Part 1) found at https://creativenumerology.wordpress.com/2010/01/01/2010-a-triangular-year-part-one/. Then permission to reprint Parts 2 & 3 spaced out in intervals of 1-3 weeks. Full credit will be noted and I will include any links for more info that you would like to include. I would love to bring more exposure to you and share your wonderful teachings with my readers. Please let me know, Kathleen. Hello Kathleen, thank you so much for your interest. I will respond by e-mail tomorrow, 9/24.